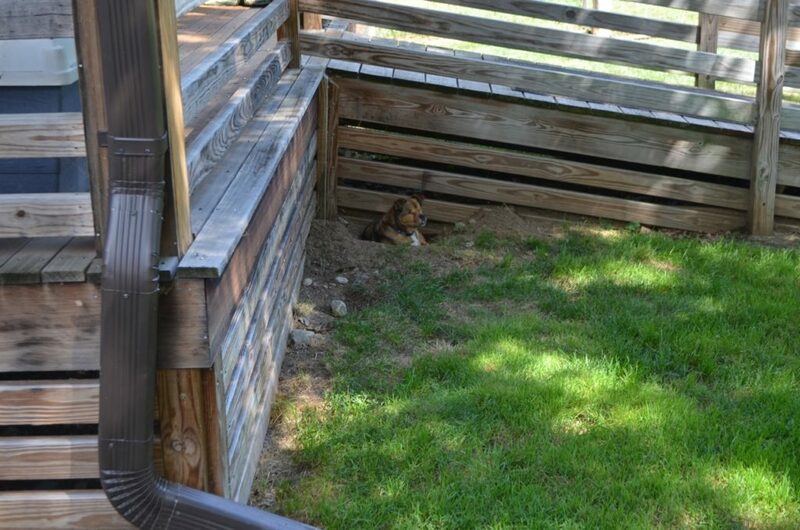 Alayne took these photos yesterday morning of Bugsy in a freshly dug hole. 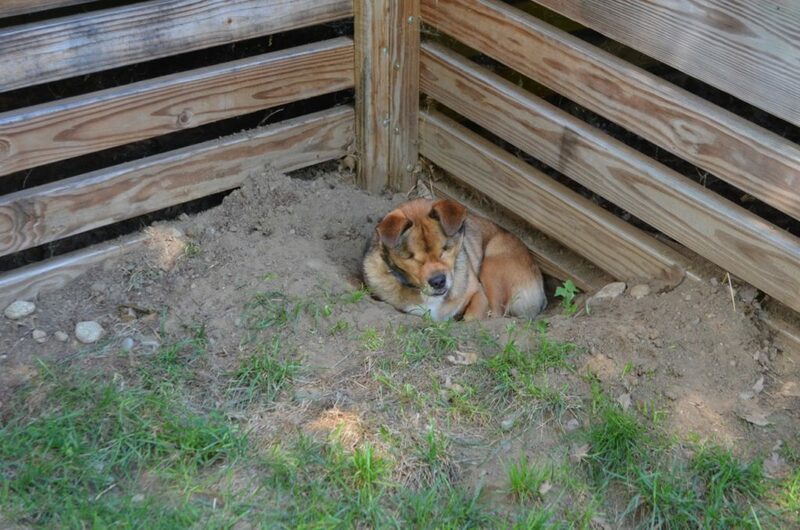 Bugsy loves to bed down in dirt holes he digs along the railings. What made this different is that he didn’t actually dig this one. Darla dug it out on Saturday, in two separate sessions, and Bugsy moved in on Sunday. So exactly why she was digging that big hole is a mystery to us. Best of all, no labor involved for him! It seems that Darla was trying to tunnel her way out of the yard – and I can’t believe she was doing that since she has the best life right where she is – or, she was making this spot just for Bugsy, which I think is the case. It fits him perfectly and is in the best area. Maybe he asked her to help or maybe she just did it to be nice. Either way, Bugsy is one happy guy. LOVE IT WHEN THE DOGS ASSIST EACH OTHER IN WHATEVER WAY POSSIBLE. Too cute! What a smart boy letting someone else do the work!! Hmm, I think Darla was digging in order to get at something she smelled or heard. The hole was just a nice by-product for Bugsy. Just his size! I see that a new Shelter challenge starts this coming Monday. Everyone get ready to vote!! Bugsy feels secure. Thank you Darla.